Plain Escape is another point and click puzzle game created by gamesmount. Your objective is to plainly escape from the house with shortest time possible. 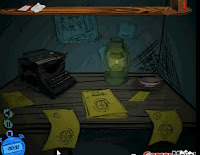 Pretty simple but you will have to find items and clues to solve the riddles in your way. Navigate around by using the bars on the side and bottom of the screen. This game is basically a room escape game so you will only have to play using the mouse. Meanwhile, here is a (PE) Plain Escape walkthrough if you need some hints or tips to finish the game.